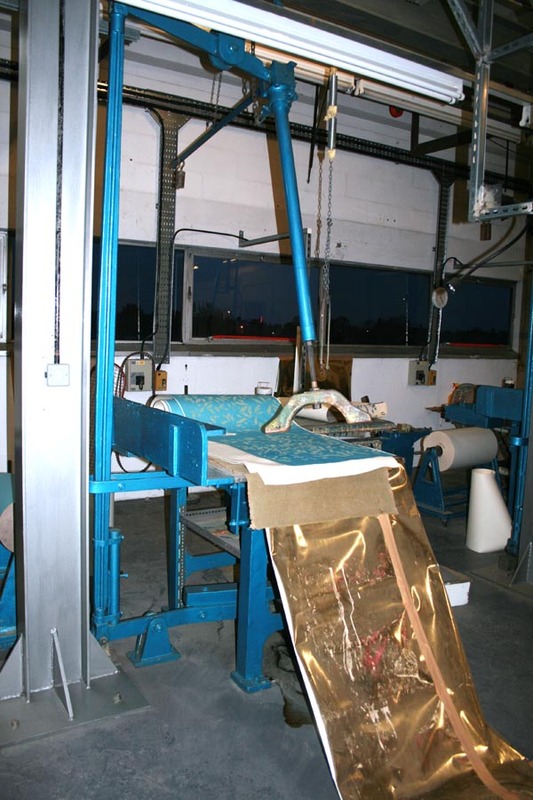 A few weeks ago I visited a number of wallpaper and fabric factory's in the north of England. 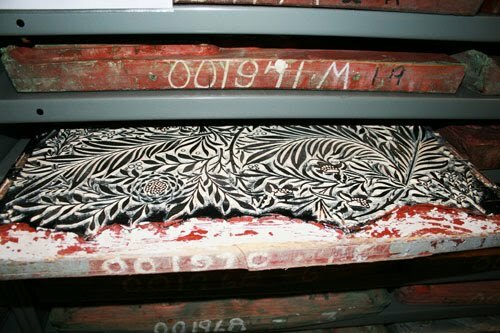 It was very interesting to see the many different printing machines and processes, but one of the highlights was seeing the original wood blocks of William Morris, along with the simplistic, wallpaper printing machine (below), which these blocks are still sometimes printed on today. The image above, shows the block from the design 'Larkspur'. This was the monochrome version designed by Morris in 1872 and cut into pearwood. 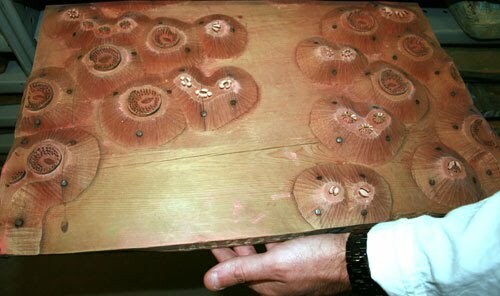 Here the block is composed only of wood, but for some of the more intricately patterned blocks, metal was used as well as, and later in place of wood. Below is a block from his design 'Apple' (1877) showing this intricate metal detailing. 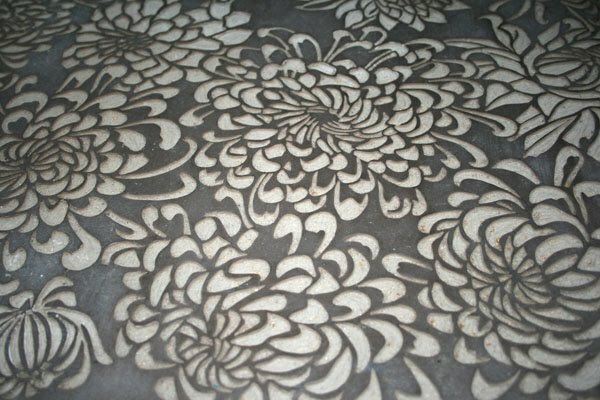 My interest in block printing originated during my degree in printed textiles at Camberwell School of Art and Crafts (as it was then) in London between 1982-5. Here we were taught traditional print skills such as block and screen printing. Allowed only to use black and white for our entire first year, while learning to stretch screens, mix dyes, cut blocks, dye yarns and fabrics, thread simple warps etc. The emphasis primarily, was placed very much on developing skill both in craft and in drawing. Only in the second year did this lead into an introduction and practical study of colour. Reminiscing about this recently - I remembered how fed up we felt at the time to not be able to use colour and it was only much later that I could appreciate the discipline of using black and white to learn the value of tone, contrast, texture and line. One of our visiting lecturers was the textile printer Susan Bosense. Encouraged to start printing herself through her connection and friendship with Dorothy Barron and Phyllis Larcher, two leading British hand block printers working in the 1920's and 1930's, she in turn, inspired and encouraged many textile designers to set up their workshop and start printing. Her invaluable book 'Hand Block Printing and Resist Dyeing' was published by David and Charles in 1985. 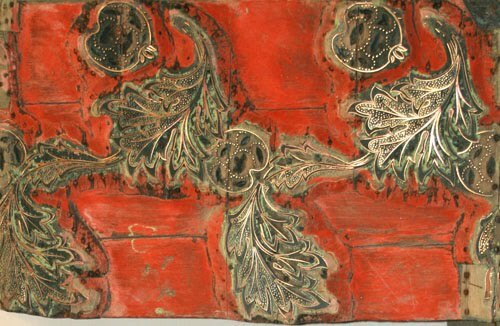 It is not really surprising, that when, during my final year, I won a Royal Society of Arts travel award, I decided to spend one year in India studying wood block printing. Initially, I spent time at various block printing factories outside Delhi, later I travelled off the tourist trail, to places, such as Barmer in Rajasthan to study the specialized block printing traditions of these towns, which were often incredibly basic. In Barmer (vegetable Azarakh printing), I witnessed block printing using boards which were placed on the printers lap as he sat on the ground, the fabric dried quickly in the sun and the metreage of fabric was passed along the board as the fabrics were printed. Often, as I recall, three or four colours were printed in this way! Barron and Larcher and Susan Bosence's fabulous block printed fabric books were originally kept at the Holburne of Mentrie Museum in Bath, where I first saw them in the 1990's. Today these inspirational collections are held at the Crafts Study Centre in Farnham and well worth a visit!